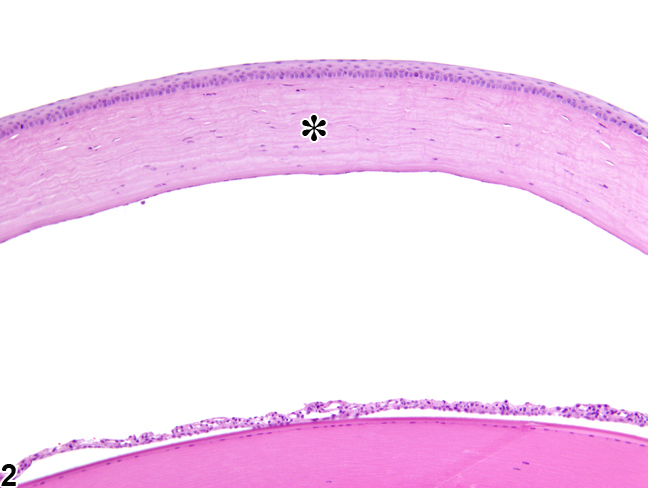 Eye, Cornea - Normal in a control female F344/N rat from a chronic study. 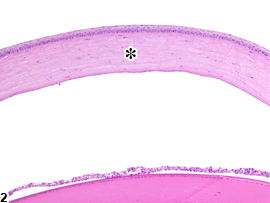 Normal cornea (asterisk) is shown for comparison. 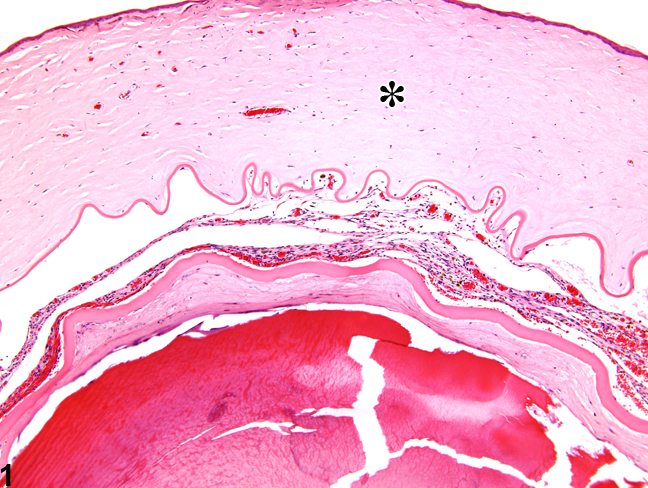 The transparency of the cornea is to some degree due to its relatively dehydrated normal state (compared with other tissues) and to the orderly stromal lamellar architecture. Increased stromal fluid (edema) increases corneal hydration and disrupts the lamellar arrays, thus resulting in loss of transparency (often described clinically as corneal "haze" or "opacity"). Corneal edema is often associated with inflammation (of various etiologies) but can also result from osmotic derangements due to corneal endothelial malfunction; increased permeability of limbal vessels; and changes in intraocular pressure. Corneal stromal edema can sometimes be difficult to distinguish from artifactual clefts and rarefaction. Corneal stromal edema (accumulation of eosinophilic proteinaceous fluid) results in overall thickening of the cornea ( Figure 1 , compare to normal cornea in Figure 2 ). 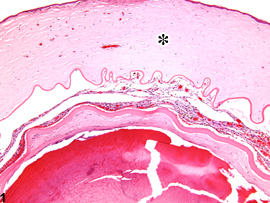 The edematous cornea may also exhibit disorganization and separation of the stromal collagen lamellae, stromal neovascularization, and Descemet’s membrane folding ( Figure 1 ). Corneal edema should be diagnosed and assigned a severity grade. When corneal edema is considered a feature of inflammation, it should not be diagnosed separately, unless warranted by severity, though it should be described in the narrative. Behar-Cohen FF, Savoldelli M, Parel J-M, Goureau O, Thillaye-Goldenberg B, Courtois Y, Pouliquen Y, De Kozak Y. 1998. Reduction of corneal edema in endotoxin-induced uveitis after application of L-NAME as nitric oxide synthase inhibitor in rats by iontophoresis. Invest Ophthalmol Vis Sci 39:897-904. Greiling TMS, Clark JI. 2008. The transparent lens and cornea in the mouse and zebra fish eye. Semin Cell Dev Biol 19:94-99. Maurer JK, Parker RD, Carr GJ. 1998. Ocular irritation: Microscopic changes occurring over time in the rat with surfactants of known irritancy. Toxicol Pathol 26:217-225. National Toxicology Program. 2001. NTP TR-501. Toxicology and Carcinogenesis Studies of p, p'-Dichlorodiphenyl Sulfone (CAS No. 80-07-9) in F344/N Rats and B6C3F1 Mice (Feed Studies). NTP, Research Triangle Park, NC. Yoshizuka M, Haramaki N, Yokoyama M, Hara K, Kawahara A, Umezu Y, Araki H, Mori N, Fujimoto S. 1991. Corneal edema induced by bis(tributytin) oxide. Arch Toxicol 65:651–655.